Climate change threatens human civilization as we know it. That’s not hyperbole. It is the robust consensus of the international scientific community. In 2018, the International Panel on Climate Change (IPCC) released an urgent report warning that we have roughly 12 years to drastically curb carbon emissions before global temperatures reach 1.5 degrees C above pre-industrial levels. Additional warming past 2 degrees C could cause sea levels to rise several meters, inundating most of the world’s highly-populated coastal cities. Alarmingly, the world is on track for even higher temperatures, risking cataclysmic interruptions of the ecological systems on which humanity sustains itself. Threats to freshwater access, agriculture and marine fisheries would jeopardize billions of human lives. And for the hundreds of millions of people threatened by rising seas, “catastrophe” scarcely begins to describe the choice between drowning and mass resettlement. In Utah, impacts will also be severe. As snowpack declines and melts more quickly each year, water supplies will plummet. Drought will become the norm as the snow that feeds our watersheds disappears from the mountaintops. Forests ravaged by bark beetle will be consumed in firestorms. The Great Salt Lake is predicted to nearly dry up completely. Local climate impacts alone will devastate our communities and will only be exacerbated in the context of globally disrupted systems. We are quickly approaching a breaking point. In the endless extraction of profit, corporations and the politicians who serve them have doubled down on fossil fuels and exploitation at the expense of people and the planet. Infinite growth on a finite planet is not socially productive, but destructive. Poor and working people, especially communities of color, are already suffering from the consequences of climate change: rising food prices, polluted air and water, deadly heat waves, and flooded homes. Millions more will be forced to flee as seas rise and crops fail. Migrants seeking refuge from violence, poverty, and the first consequences of climate change are already met with hate, not solidarity. North America and Europe are moving closer to virtual eco-apartheid as those in power militarize borders, privatize common resources, and hide behind walls — all while denying climate change itself. While the ruling class profits handsomely from the unfolding disaster, working people and future generations are left to suffer the consequences. We need ambitious solutions to ensure a livable future for all, addressing both social injustice and ecological devastation. Last November, democratic socialist Rep. Alexandria Ocasio-Cortez, along with the youth-led Sunrise Movement, launched a nationwide campaign for a Green New Deal. Necessarily ambitious in scope, a Green New Deal would create millions of well-paying, union jobs, building a sustainable economy while democratizing critical sectors, such as energy. Immense quantities of labor are needed to decarbonize every industry and only by reclaiming democratic control of the economy can such a rapid mobilization produce an equitable and successful transition. Only we, the people, can save ourselves by building the physical and social infrastructure for the world we need. A Green New Deal musters the courage to boldly fight for our collective human future. Paul Waldman: Can Jay Inslee make the 2020 election about climate change? 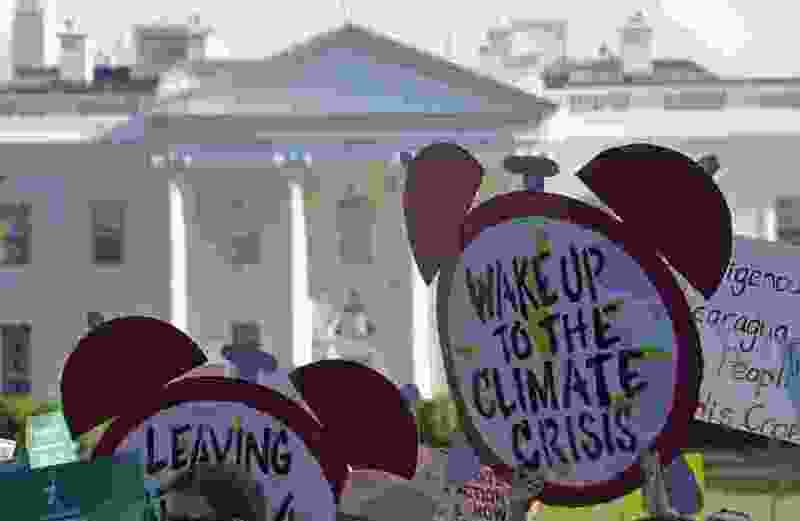 We who support a Green New Deal have reached the conclusion that anything less than decisive, collective action against the existential threat of climate change is simply unacceptable. A society that prioritizes our very survival over the indulgence of the rich is not a radical demand. We as democratic socialists recognize capitalism as the perpetrator and perpetuator of the climate crisis, but we also know that a just and livable future is possible. The Green New Deal is our chance to win it now. Atticus Edwards, Matt Kirkegaard, and Weston Wood are ecosocialists and members of the Salt Lake chapter of the Democratic Socialists of America.